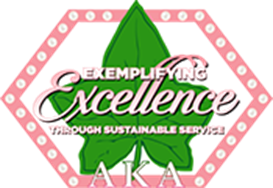 Rho Upsilon Omega chapter is excited about our new 2018-2022 Program “Exemplifying Excellence Through Sustainable Service.” under the leadership of our International President, Dr. Glenda Glover. The international program addresses the needs of the community in five target areas, seven impact service days, and a signature program, #CAPSM which is the abbreviation for College Admissions Process. It is designed to assist students in their efforts to enter college by providing a hands-on approach that includes all the steps from researching various colleges to completing the application process. In addition to the commitment to serving our community, Alpha Kappa Alpha Sorority, Incorporated is committed to leadership development of its members with the launch of the AKA UniversitySM! This educational platform provides education, training, and leadership development so that members can enhance their personal development and provide more impactful service to the community. Copyright © 2019 Rho Upsilon Omega Chapter. All Rights Reserved. Alpha Kappa Alpha Sorority, Inc. is not responsible for the design nor content of these web pages. They are the sole property and responsibility of Rho Upsilon Omega Chapter who hosts and maintains this web site. Date of Last Update: August 2018.